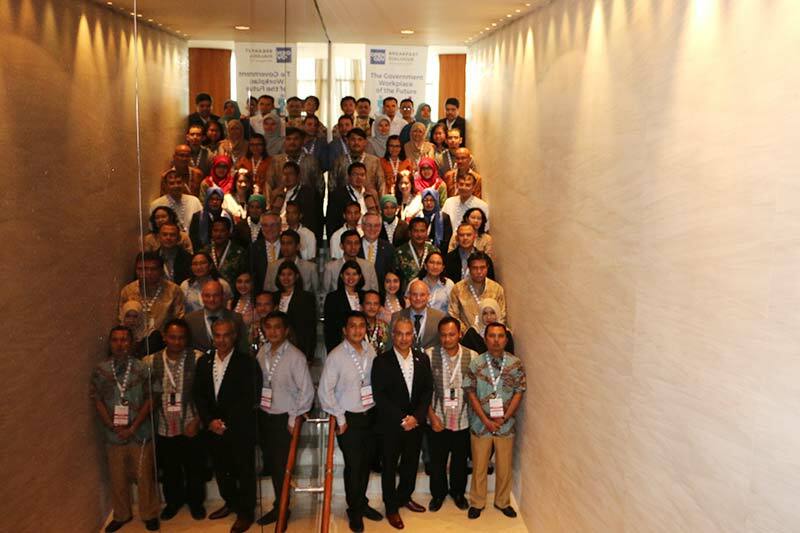 The OpenGov Leadership Dialogue, held in Jakarta on 4th August 2016, in partnership with Polycom, was all about Workplaces of the Future. It was about enabling communication and collaboration. Thirty-five delegates from the top echelons of Data and ICT division across ministries and agencies in the Indonesian government attended. OpenGov Editor-in-chief, Mr. Mohit Sagar, kicked off proceedings by reminding the audience that technology does not wait. It grows, it jumps, it leapfrogs. If organisations don’t adapt, they fall by the wayside. Mr. Tony Sandberg, Director, Solutions and Industry Marketing Asia Pacific, Polycom summarised what Polycom is doing in the collaboration space. Polycom enables work across departments, distances and devices by bridging gaps and bringing together video, voice and content. The Head of Jakarta Smart City Management Unit, Mr. Setiaji, talked about Jakarta’s journey towards a smart city and the role played by his workplace in that. The Smart City offices are open not just to other departments and agencies within the government but also to citizens. According to him, the key to their success is connection and collaboration, through open workplace and applications. Mr. Marc Dimmick, CIO from the Department of Sports & Recreation presented a Western Australian (WA) perspective, where they were, where are they at and where they are going to. WA is a massive landmass spread over 2.65 million square kilometres of land, with a population of 2.6 million. The Department has 7 regional offices and 5 managed camps, where schools and corporate bodies come together and which can manage 250-300 people at a time. He described their journey from an earlier time of poor communication and things moving slowly. The regions outside the cities didn’t get services and goods on time. But thanks to technology, information can be delivered anytime, anywhere, any device. Mr. Dimmick moved on to discuss the challenge of digital Darwinism, ‘Society and technology evolving faster than ability to adapt’. He talked about ‘Change fatigue’ in governments, how they can’t cope with the pace of change and things need to be slowed down. But change doesn’t stop. Instead, it keeps getting faster and faster. Delegate discussion was sparked off by the first question about key drivers that will accelerate Jakarta&apos;s journey to a smart city. The ability to respond quickly to problems and emergencies and citizen engagement garnered the most votes at 31% and 28% respectively. Devy Listia from the Ministry of Finance described the importance of customer engagement for their applications, services and products, as their adoption and usage would grow through word of mouth if they use it, engage with it and respond positively. Citizens are very important, as their involvement provides feedback to the government to improve services and meet expressed needs. Mr. Sagar asked if the delegates would prefer to have video as the mode of communication for enabling quicker response. It can also optimise the utilisation of resources, by directing the right agency to the right emergency at the right time. Setiaji mentioned the use of images and locations in the Qlue app to deal with problems. There was a stimulating discussion on privacy matters related to collaboration and why they might not be relevant in a crisis situation. The next question, &apos;What areas will collaboration tools impact Jakarta in becoming a smart city?&apos; generated a clear favourite with the option of ‘Sustainable infrastructure’ at 64%. All options were relevant but the rest could be seen as flowing from Sustainable infrastructure. Marc Dimmick stepped in to contrast traditional practices vs modern open approaches. He also addressed challenges related to integration and inter-operability across standards. Subsequently, the floor was opened up to the delegates. They shared the current situations in their respective offices, whether they were on the left hand side or the right. Problems related to old buildings, legacy designs, costs, lack of awareness and cultural resistance were dissected and solutions proposed. The importance of leadership was brought up when it comes to IT adoption and implementation. The next question addressed to the delegates was whether IT is looked at as a cost or an investment. The discussion veered to budget constraints and the kind of returns governments look for while doing IT acquisition. Budgets and limited bandwidth were selected as the top two barriers to adoption of solutions like video conferencing. Mr. Dimmick gave an example of an AUD 100,000 investment in video conferencing in the Department of Child Services to demonstrate how IT investments can bring great returns but how IT forgets to communicate the story at times. IT was criticised for making unnecessary expenditure. But the investment reduced travel, boosted productivity and ultimately led to estimated savings of half a million dollars! Mr. Mohit Sagar moved the conversation forward to the assorted costs of travel, how they have to be analysed and tallied in order to present the case for better collaboration internally. The change has to initiated from within. Technology could transform the way people work and it could even address culture-specific concerns. Technology can truly liberate work from being shackled to time and place. The Department of Sports & Recreation in WA has rolled out video conferencing around the state in the form of regional hubs. The hubs are shared with police, emergency services, education and health departments. Regional offices are planning to extend that to the field. Following on from the lessons learned from that, resource utilisation is being optimised and infrastructure redundancies being eliminated. The discussion flowed towards Transparency as an essential component for change, as it brings in accountability. Social media can play a crucial role in making governments more accountable. Further questions focused on the adoption of collaboration tools in general and in specific sectors, drivers, benefits, barriers.When asked about the environment where delegates would like to use tools such as video conferencing, opinions were split between traditional conference rooms and all locations, including those outside office. For seamless integration and real-time information sharing, transformation has to be absolute. Change will not happen overnight. It will be hard. But if old ways result in old outcomes, that needs to be highlighted. The transformation cannot be accomplished without looking at each department’s specific needs and strategising accordingly. Over 50% of the public sector workforce in Indonesia is under 30. Their work habits and preferences are very different from those of earlier generations. As technology changes, the millennials change and they change society and the world. For government to attract the best talent from this generation, it has to keep up with the times and transform the way it works.